DOT is currently implementing the bike lane project in the area and as with many other bike lane projects around the city, we know there is a learning curve. Our Street Ambassadors will be in the area later this week to share information with drivers, cyclists, pedestrians and the community in general about this street improvement project. In addition, we will continue monitoring the project. DOT had yet to add green paint, which the agency is holding off on until utility work in the area wraps up. The bike lane is still missing the paint, but conditions appear to have improved substantially. On Wednesday, Streetfilms’ Clarence Eckerson captured the above footage, and the lane was mostly clear of parked cars. A few parked cars continue to obstruct the eastern end of the bike lane, which runs between Shore Boulevard and 37th Street. One car in particular has been sitting there for days and seems destined for the tow pound, Clarence says. Yeah, try riding it when people are standing around for the driving school. Or try “turning” out of it at some point other than signal-controlled intersections. I have no idea why this “upgrade” was needed on 20th Ave. Before, you had relatively low traffic and wide painted bike lanes that were usually pretty navigable. But now getting to the bike lanes on 35/36 require crossing traffic lanes (rather than simply merging into and turning out of traffic), and getting out of the lane EB requires one of those stupid “kink” maneuvers the DOT is always building into our cycling infrastructure. Not every edge road works as a Kent-style bike arterial, nor do they need to. The lack of protection was not keeping cyclists away from 20th Ave.; they weren’t using it because it doesn’t connect them to where they’re going. They might start by getting the trucks, buses, and cars that use it as a parking and driving lane out. I never even try Vernon NB and I take other streets SB, it’s so consistently blocked. I would prefer that they just leave Vernon alone, instead of devising “solutions” to what it does in Ditmars and Hunters Point, because I fear that more attention to Vernon will result in scraping off the sharrows that effectively permit NB cyclists to ride in traffic unaccosted. And the condition of the roadway has deteriorated as a whole. A scraping and repaving job of the whole street is definitely in order. This is a vast improvement. Cars absolutely whizzed by on 20th Ave before. Drivers never respected the bike lanes. Now? As stress-free as it gets. 7 seconds in you see a bus stop literally IN the bike lane. How we think that makes it safer for cyclists blows my mind. Build a new floating sidewalk for straphangers, but don’t make the bus leave the moving lane & block the bike lane. Not a fan of this design here, or on Vernon Blvd either. I’d say the opposite. Given the low volume of car traffic on 20th Ave, this was a missed opportunity. DOT could have used this as a chance for even greater experimentation and innovation, instead of rolling out old 2009-era designs. As Paco noted, floating bus stops would have been one good design feature to try here. And they could have done more to make it easier and safer to leave the bike lane at more than just the signalized intersections, as you note. So it’s a great effort on 20th, but they need to upgrade to Bike Lanes v. 2.0. I think “floating” bus stops are planned here (first in the city?) but they haven’t poured the concrete yet. One thing I notice in the tweeted photos, and here in Manhattan on the new Amsterdam lane, is that the parking signage still hasn’t been changed by DOT. Most on Amsterdam have now been changed on the bike lane side, but not on the east side of the avenue, to reflect the other changes as part of the plan, like the right turn lane at 96th Street. You’re lying through your teeth. It’s by no means “stress-free,” particularly if (as I’d noted) you’re trying to get to the N/S bike lanes through the neighborhood from the lane or if you’re going EB past the end of the protected section. I rode the old lanes all the time. Now? I take 21st Ave.
Oh, come on. You’re talking about a “missed opportunity” to “experiment” with floating bus stops, while ignoring the fundamental ways this “protected bike lane” disserves any cyclist that wants to use it? I’m all for experimenting with features that can protect cyclists from car and bus traffic. Let’s do that an true bike arterials. What I’m pointing out, here, is that this isn’t a particularly convenient or well-designed bike lane for any person who would actually use it to get into or through this area. That anyone is celebrating it like it’s a model to follow here just helps to show how nutty some members of the advocacy community have become. It’s like you’re more interested in “proofs of concept” than serving the cyclist community. The driving school that congregates there is an annoyance, to be sure, but even the video you cited shows how little of a problem it was: no close passes in the main traffic lane, the cyclist is going a pokey 5-10 mph maybe while taking the video, the oncoming traffic lane isn’t too busy. It was never a Jay Street-style pattern of total disregard for the lane, so you shouldn’t portray it that way here. I keep fantasizing about a huge green stripe being painted on the vehicles parked in the bike lane. We should go back to the DOS stickers of shame that took forever to scrape off. Shame, inconvenience, and monetary fines. These are the only things that really work. The cyclist community needs to grow to include more than just dudes like you and me. This design isn’t perfect, but the interested-but-concerned crowd wasn’t going to merge with traffic to make left turns or feel comfy riding in wide painted bike lanes. Yes, look how stress-free it was before. I know I’d feel comfortable letting my child bike on her own power here. We shouldn’t be designing infrastructure to entice the “interested but concerned” crowd to come out that still expects them to pull off expert maneuvers or to have a keen sense of traffic. That’s the problem with so much of what we’re building – we create this illusion of safety that breaks down with every mixing zone (like with the Avenue bike lanes in Manhattan), or at a bus stop (like on 20th Ave. or the proposed Jay Street redesign), or with a zig-zagged lane (like the 20th Ave. lane does EB, when it ends), or illegally parked car (like NB on Vernon). I mean, Queens Boulevard is an improvement, but is any experienced cyclist who’s ridden on it sending out their kids unattended to figure it out on their own? And then we’re building so much of our most appealing infrastructure in places where it’s borderline useless. 20th Ave. is not an arterial street to anywhere. Who’s taking it? Likely most of the people who are taking it to get to or from Vernon would be far better served by protected infrastructure on 21st, 31st, or Steinway. We’re building an out-of-the-way lane to get to another out-of-the-way lane. For the “interested but concerned” crowd. It’s idiotic. It just seems so often to me that the people celebrating this infrastructure don’t bike. That seems incredible, but I have no other way to explain why they don’t view all the stress points that are obvious to me, an experienced cyclist, in the stuff being built for the novices. Crazy talk. The old 20th Avenue may not have had too much traffic, but what there was typically would blow by me at 30+ mph, 40+. And then having a bike lane double parked in, just not good. This new design is great. Great enough so that I would now let my kid ride on 20th Avenue, maybe I’ll go test it out on Sunday. I don’t understand all the crying about it. Someday because of infrastructure like this we’ll have a whole lot more people riding. Perfect! You can do that. World is all about options. In my neighborhood in Jackson Heights I have been riding 35th Avenue versus the 34th Ave bike lane for more than a few reasons. Don’t you see the ring of green that is developing from 20th Avenue which will eventually stretch to Bay Ridge? That’s the goal and the farther that streches, the safer routes people will have. As it is you can ride about 6 miles from 20th/Steinway to LIC and *most* of it is safe, because as we know sometimes there are vehicles parked in it here or there. Maybe not safe enough for an 8-80 qualification, but certainly getting better all the time! I did three takes of that. In the first one a car came so close to me I fumbled the camera and messed up. So i specifically waited until there were no cars coming to get a better shot. It is certainly not a Jay Street thing here, never would portray it as such. But it is now safer and kids can get to the park as safely as possible. That’s the key here – it’s an upgrade for kids. Some of these safety upgrades are annoying to me as a road cyclist – but I’d like to see more children and families riding and this is the only type of infra that will get that going in large numbers. Yeah, and what kids are taking 20th Ave to get to Astoria Park, which is two long blocks south of it? Wouldn’t it make more sense (and be safer) for them to take more direct routes through the internal side streets of Astoria? This is just asinine. A “ring of green” isn’t a “route.” The vast majority of people living in Astoria and LIC (or outside those neighborhoods) who want to bike commute within those communities are not going to include an inconvenient diversion to Vernon/Shore/20th unless they’re going to places that are relatively near to the edges of those neighborhoods. If you’re more than a few blocks from Vernon, you probably aren’t going to take Vernon to get to/from the Queensboro or Pulaski bridges, and there is virtually no reason ever to go up to 20th Ave. if you’re going to/from most of Steinway or Astoria. We need “internal” routes, and the best we have so far are painted lanes on streets with multiple stoplights and poor light timing for cycling. We need them on the major N/S and E/W arterials in these neighborhoods, not on this “ring of green” that serves no purpose other than to satisfy the egos of a few advocates with too much time on their hands. I shouldn’t have to find alternative routes because “experimentation” with cycling infrastructure on peripheral streets that serve few cyclists makes my preferred routes unusable. That is the exact opposite of what we should be doing with our cycling infrastructure. 20th Ave. no longer “works” for me because (1) leaving the lane at any point between Shore and 37th requires stopping and crossing a street that sees enough traffic that it can be hard to find a safe “window” to cross, (2) leaving the lane EB at 37th requires a stop-zag-stop maneuver (whereas before, I’d be able to just go straight with traffic), (3) even a single obstruction – pedestrians, bus, parked car, etc. – forces EB cyclists to dismount, ride onto the sidewalk, or ride into oncoming traffic. Basically the only people for whom this represents a true “improvement” are people on the north edge of Steinway who want to bike to Astoria Park. For everyone else, this is a more inconvenient, difficult-to-use lane. It’s the same way with 34th/35th Avenues in Jackson Heights. 35th probably feels better to you now than 34th because you can take the lane and navigate conflicts freely, without the constraint of being expected to use the bike lane (or having to guess what drivers are going to do as you try to use the lane alongside them). It’s the painted bike lane on 34th Ave that makes you feel less safe, as a cyclist. That’s bad design, in a nutshell. I never encountered traffic that fast on 20th Ave, though admittedly I rarely rode it in the evenings. I am not sure why people would be driving on it faster in the evenings than in the mornings. “Maybe I’ll go test it out on Sunday.” Ah, yes – so this isn’t something you ride on that often, is it? Where would she be biking to, anyway, on this street? Do you live near to this lane? Look at where 20th Ave is and what it connects. I’ll agree that a protected bike lane on 20th will get “kids” to/from the Park more safely, if they’re coming from/going to a place relatively near to 20th or north of 20th. But for everyone else, 20th is a diversion – they’ll want to take 21st, Ditmars, 23rd, 24th instead. Really, the only reason that I ever took 20th Ave, myself, is that I want to add miles to my commute. And, really, if your daughter can’t handle a truck parked in a painted bike lane, she probably can’t handle a bike lane with a bus stop in the middle of it, or a parking-protected bike lane with a parked car in it, or crossing 20th from between parked cars at an unmarked, uncontrolled intersection. Just about the only thing she’d be able to do is ride the 20th Ave lane from end to end. As long as NYPD parks in the bike lane (or uses it as a daily parking lot, as at the 28th precinct on 122/St. Nicolas – https://goo.gl/maps/k3wPwGarMCS2), how can expect this behavior to change? This is the only type of infrastructure that will do that, true, but this lane is not up to the standard that will do that (it has too many elements that require “expert” navigation skills) and it is on a street that is out of the way for 90% of the families/children who would use it. It makes no sense to tout this kind of infrastructure just because, on paper, it fits some “ideal.” We need to think about the actual community where we’re putting it. This kind of design would have made a lot more sense on the N/S arterials in Astoria or on any of the E/W arterials that would run actually to the Park (instead of to an industrial corner two long blocks north of it). But instead, it’s up here, where no one has any reason to go, because the DOT saw that it had space on the street to implement it without losing a ton of parking. Like – Ditmars. Look at Ditmars. It’s got shops and homes and would be a wonderful place to put protected bike lanes. It would connect directly to the northern edge of the park. Thinking about it, we could do something really lovely and pedestrian-friendly there where Ditmars runs along the park. 20th Ave in this area, in contrast, runs past mostly industrial properties and parking garages; the businesses are primarily auto-oriented. It’s a street the neighborhood almost literally turns its back on. And even what’s there is on the other side of the street from the bike lane, so even getting to or from the lane from most of the neighborhood requires venturing across 20th Ave. This isn’t going to be the next Kent. This is going to be a downgraded version of Vernon, another under-utilized two-way bike lane that doesn’t see a lot of cyclists using it, because it doesn’t connect them to where they want to go. Bike lane or world’s largest NYP Scooter parking facility/Hotdog cart transportway/FedEx loading and unloading zone? Not daily, sometimes not even weekly, but I’m there often enough I have ridden it three times in the past five days, sometimes my rides, business, eating habits or commuting takes me there. “Test it out” refers to meaning with my son riding his bike. Dude, you need to chill it out a bit, even if I rode it three times a year I’m a bike rider in NYC, we need this kind of facility all over the place. If someone brings a radar gun over there I’d bet any amount of $$$ that half the cars are going over the speed limit. This is useless without bollards to keep parked vehicles out. Why does NYC keep making the same mistakes over and over with bike lanes? It’s obvious the NYPD won’t or can’t keep them clear of cars. The only solution then is to accomplish that with steel and concrete. Put a jersey barrier where the buffer zone is. At intersections put a bollard right where the yellow dotted line is. Cars shouldn’t be able to physically enter a bike lane, period. 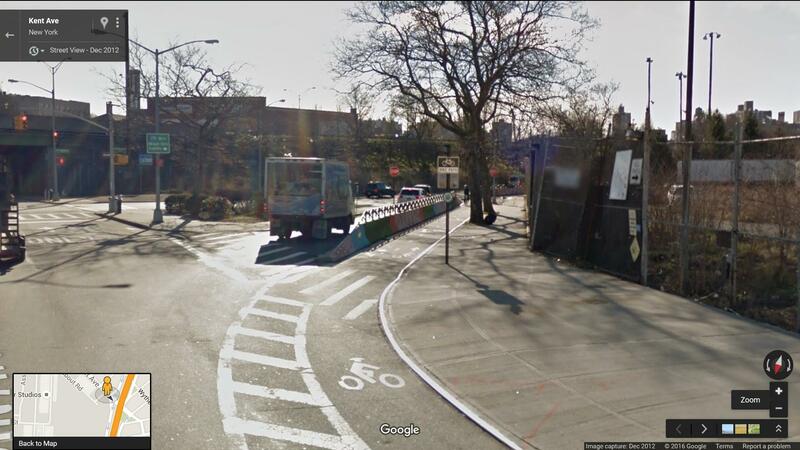 I thought they were doing protected lanes on the periphery of Astoria Park too? Sorry I’m only paying half attention. I assume you can figure out I live on the other side of FMCP from my screenname. There’s one on Shore Boulevard, which borders the park. I am not sure we needed it there – we needed cars off the street, not necessarily a bike lane, but the bike lane is how we got half of the cars out – and it has its own design problems. For instance, there is no direct SB out of it (SB cyclists must turn east on Astoria Park South and find some other way to continue south) and the northern end of it appears to divert NB cyclists across oncoming traffic from two directions to the mixed-use path along Shore north of Ditmars (which I have been ignoring). It, like 20th Ave, isn’t really there for anyone trying to go places other than the Park. But it, at least, is not designed in a way that adds conflicts for NB or SB cyclists relative to what was there before, and it should go a long way toward calming the street for park users (which is probably the primary goal along Shore by Astoria Park). I have to go slower there than I would like, but considering that the nearest alternative is 21st Street, which I stay away from in the current configuration, I’ve kept using Shore even while I’ve left 20th. Yeah, it’s awful in LIC. A lot of the streets down there need to be repaved; I am not looking forward to it. It’ll be fun to see how long it takes them to re-paint the Vernon lanes and re-install the concrete buffers. When Kent was built very little of what is there now was there. Many people could have made some of the arguments you’re now making. Not that 20th will suddenly be lined with condos, but when Kent was built there absolutely would have been better places for a protected lane to get cyclists closer to shops, apartments, etc. 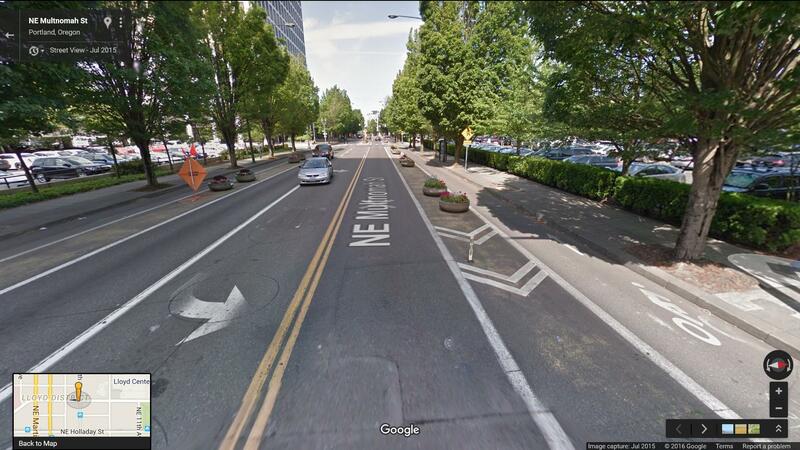 That there are better places to put a protected bike lane doesn’t mean it isn’t worth it to put one here. Kent works for many reasons. Kent works because it’s actually a good direct route to/from Williamsburg, Greenpoint, LIC, Astoria, etc. and the employment centers of downtown Brooklyn. Kent works because the closest alternatives – Bedford, Berry, Wythe, etc. – are unpleasantly traffic-clogged, unsafe for cycling, and inconveniently signal-controlled. Kent works because it’s not hard to leave the lane at any point along its length to head inland, due to regular signaled intersections, and it’s possible and safe to have a nearly continuous ride along it, due to the lack of cross-traffic and fairly lenient enforcement of the red lights. (Which is itself a product of the fact that it sees so many cyclists, due to its being so useful.) Kent works because it’s easy to get to/from it from the Williamsburg and Pulaski bridges, and it makes sense to take it rather than alternative routes if you’re traveling between them. Kent works even more now, given the residences and businesses along it. But it worked before those were there, too. If the case for 20th Ave is there, then someone should be able to make it. So far, the only rationale for it I’ve seen provided is exceedingly abstract – “We need these lanes generally” – or bizarrely specific – “I’d let my kid ride on it.” We’ll rack it up in the “win” column and just keep building cycling infrastructure in Astoria that doesn’t make a lick of sense. You don’t mean a continuous line of jersey barriers though, right? That would make it hard for people to get to their parked cars, enter the right side doors, and for pedestrians to cross mid block. Something permeable would be better. Install too many and if cars are lined up with the gaps you’ll have effectively blocked midblock crossings. And I think you can get something a bit nicer than a jersey barrier. Although the painted ones by the BQE on Kent are kind of nice. At least the side that’s painted is kind of nice. At intersections put a bollard right where the yellow dotted line is. Sounds like something someone would bike into and then sue the city. Maybe we can rig up a tank to paint the cars as it crushes them. What fight are you trying to win here? Yes, there are better, more direct, routes for cyclists than 20th Ave that would put them closer to shops, transit, and other useful connections. I doubt anyone disagrees with you. But does that mean getting bike infrastructure in places where, right now, it’s easier to do so is a waste? DOT spends so much time fighting with community boards, why shouldn’t they look for opportunities where getting something in won’t wind up as yet another NIMBY casualty? Yes, it would be nice if we lived in a political climate where every bike lane that “made sense” could sail through community boards, but that’s not the reality. It’s possible to chalk this up as a win while still pushing DOT to do more. It’s not an all-or-nothing fight. 20th Ave already had functional bike lanes. The change to 20th Ave made it worse for anyone using it except for a very specific population of riders (namely, moderately-experienced riders living north of or very near to 20th Ave who want to get to the park). The only “fight” I’m trying to win here is to contradict the irrational sentiment that a protected bike lane, wherever we can put it, is a “win.” The 20th Ave lane is purely a symbolic victory; one that the DOT will tally on its books to show its “progress” in building out the cycling network, and one that outlets like Streetsblog can feature as showing “progress.” But it’s propaganda, at best. I mean – as a daily cyclist who bikes through many neighborhoods in western Queens and Brooklyn and frequently in Manhattan, I have to ask, do our cycling advocates seem to be representing the interests of actual cyclists? Like, people who actually are trying to get safely to places by bike, who have to think about smart routing, traffic conditions, and the like? It is hard to square the hype over 20th Ave with the belief that they do represent these interests. It’s utterly bizarre to me. No one in this thread has responded to me in a way that suggests that they have any appreciation of 20th Ave’s design shortcomings. Instead it’s just been lectures about how everyone should love protected bike lanes, wherever we can fit them in. Am I the only one here who actually rides in that area? “Functional” for whom? For fit guys who can merge with traffic? Who is an “actual cyclist”? You should define these things, because at least from what I’m reading, your definition seems very narrow. um, maybe because white line provide ZERO protection. "How many lives is a parking spot worth?" went the chants.